Early rhododendron blossoms frame Pittock Mansion. 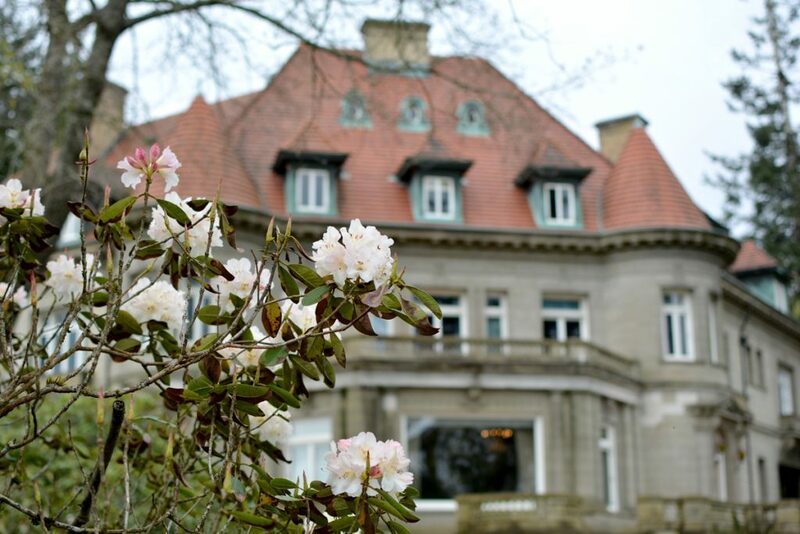 Pittock Mansion’s grounds are stunning year round thanks to Portland Parks & Recreation and volunteer OSU Master Gardeners’ hard work, but spring is an especially beautiful time of year with the rhododendrons and roses in bloom. Pittock Mansion’s original landscape plan included 350 rhododendrons and 276 roses, and many rhododendrons and roses can be found on the grounds today. Rhododendrons, in a variety of whites, pinks, and purples, begin to blossom in April and continue through June. The 100 different species of roses on the grounds, including the Gold Struck “Georgiana Pittock” Rose, bloom May through August. Visit our Facebook page to see some of the early blooms, or stop by soon and smell the roses yourself!